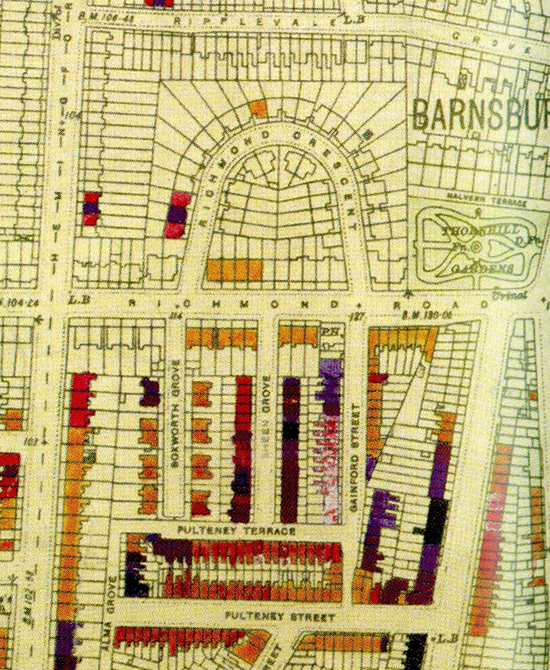 By 1900 the Harris family had moved from Ellington Street to Boxworth Grove, off Richmond Road Barnsbury. The census below dates from 1901 and shows the family now living at 8 Boxworth Grove. The family at this time comprised of Lambert and his wife Alice, and their children Alfred, Lambert Thomas, Walter, and Ivy. Also in the household were two lodgers. Unfortunately the writing on the census is appalling. The houses in Boxworth Grove no longer exist due to WW2 bombing. The map (left) shows the bomb damage to the immediate area. Those houses colour coded were damaged to varying degrees.